We started our trip in Tahiti and spent one day at sea sailing to the Tuamotu Islands. It was helpful that we had learned a lot of about the creation and geology of Polynesia while on a tour in Tahiti. The Tuamotu Islands are older than the Societies or the Marquesas. Rangiroa was once far larger than Tahiti. The Polynesian islandsare volcanic islands. The hole in the earth’s crust that let the lava flow up to create the islands doesn’t move, but the earths plates do, so as the earth’s plates shift new islands are formed from the same hole. All of this takes millions of years, it is interesting to see the stages of creation by visiting the different islands and atolls. To look out over the Tuamotu Islands you can’t imagine that once in the center was this huge, mountainous island. Now all you see is a lot of water and a scattering of motus and larger, flat coral islands surrounding it. The once magestic island is now completely submerged. Its pristine waters, far away location and small population make it an amazing place for scuba diving and snorkeling. Two of our friends had spent a week on a live-aboard doing just that. Our first stop was Fakarava. Our ship was spending the day at Fakarava and we had the choice of staying on board and enjoying the water from the back of our boat or take a snorkel tour. We opted for a snorkeling tour, which we set up independent of Windstar Cruises because their tour had sold out. We booked with Ato Lissant at Fakarava Excursions (fakaravaexcursions.com). They offer the choice of a full day tour or a half a day tour. The full day tour included a fresh fish lunch on a private beach. We opted for the half day tour since we didn’t need the food option. The Windstar tender dropped us off at the dock on Fakarava. We were greeted with fresh flowers for our hair and a local group playing music. Ato Lissant himself came and greeted us and made sure we were all set for our tour guide, his nephew. As we left the dock in the boat we truly felt like we were heading back out to sea, because as far as the eye could see there is nothing but water. Our first stop was a very small motu (island). The water was so clear you could see all the coral and fish from the boat, the visibility was amazing. We could also see the sharks! We hopped in to the water with our snorkeling gear and the first thing I saw swimming towards me was a black tipped shark. There are a lot of black tip sharks in French Polynesia and they are harmless, but it takes a while for your mind to accept that, probably due to watching Jaws one too many times! We did not need fins here, the motu was very small and the coral was directly under our boat. It was a great way to start our tour. The next stop was breathtakingly beautiful. I have never seen so many colors of white and blues. We went to an area they call the Blue Lagoon. Entering this area the water was so clear that you could see small manta rays swimming in front of our boat. We had to walk through the water to a small strip of sand and coconut trees to get to the lagoon. It was gorgeous but parts were so shallow it was difficult to maneuver. I have never in my life seen so many sea cucumbers. It really was like swimming in a little aquarium. After our snorkel we were served fresh local watermelon, which is yellowish orange in color and so sweet, and fresh coconut and drinks. Here they let the coconuts ripen and form a spongy middle which is great to eat. The third spot was near an opening in the atolls where the current was very strong. We dropped anchor – a coral rock – and many of our group jumped in to snorkel. We decided we just wanted to relax on board the boat and take in the scenery. The snorkelers had to swim a little further than they expected when our anchor/rock broke and we started to drift away. All makes for great stories. Our captain was on top of it and no one was ever in danger. I would highly recommend Ato Lissant and Fakarava Excursions to anyone visiting the area. The tour was great, staff friendly and very professional and Ato communicated well before hand via email. We were back on board the Wind Spirit in time to have lunch, shower, change and be on deck for our Sail Away at 5. The next morning we woke in Rangiroa, another stop in the Tuamotu Islands. 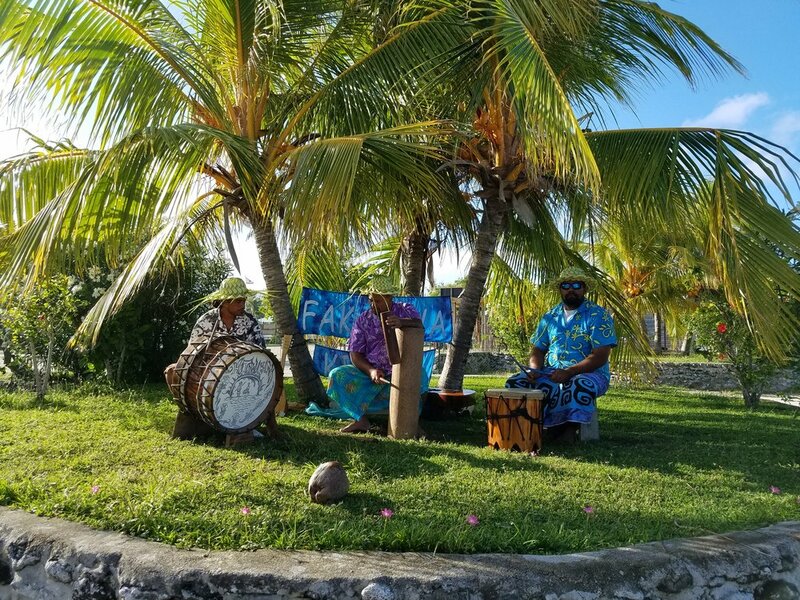 Rangiroa is known as “The Endless Lagoon” and is surrounded by two legendary bodies of water, Moana-tea ( Peaceful Ocean) and Moana-uri ( Wild Ocean). From the air it supposedly looks like a giant pearl necklace and is the second largest atoll in the world. Only two of the islands are inhabited and it was thought to have first been inhabited in the 10th century AD. The concern for the Tuamotu Islands is with climate change, with rising seas they will soon vanish forever. There are already programs in place trying to relocate the people who live in the Tuamotu Islands. One of the most famous spots for diving is Tiputa Pass. The water was a little too rough to snorkel the day we were there so we opted to just go on land and look around. It is lovely to see the contrast of the lagoon and the ocean with its crashing waves just a short walk across the island. We ended up hiring a local cab driver to show us her island. We started in Tiputa and went the entire length of the island to Avatoru. We loved the island and our tour guide was so proud to show us all around. The highlight for us was the Catholic Church at Avatoru pass, it was one of the oldest in Polynesia, beautifully situated and maintained. We headed back to the Wind Spirit after our tour and enjoyed swimming off the back of the ship. In the same harbor was the live-aboard our friends had spent a week on prior to our arrival. Sail Away was at 5 and we were sad to be leaving these amazing Atolls but glad that we had chosen the 11-day cruise so we could experience this magical place. It really set the stage for an incredible vacation and with a day a sea to get here, 2 relaxing days enjoying it and another day at sea until we were back in the Society islands we were as laid back as I think I have ever been in my life! The colors pleased my eyes, the warmth of the tropics suited my body, the smell of the ocean cleared my head and the slow, friendly pace comforted my spirit. I was in full vacation mode now!